The course of the Second Vatican Council must be corrected and the 1970 liturgical reform must itself be reformed if justice is to be done to the Council, Cardinal Kurt Koch, the new head of the Pontifical Council for Promoting Christian Unity has said. 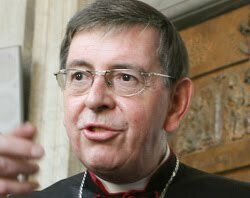 In the public domain, Vatican II had usually been presented as a break with church tradition but this interpretation was only possible because the Council declarations had been read selectively and not taken as a whole, Cardinal Koch told the Austrian Catholic online news service kath.net on 19 November. De som kan tysk, kan lese det ganske grundige intervjuet med kardinal Koch her. In a Platonic format of questions and answers, the conversation, deftly guided by German journalist and author Peter Seewald, was recorded last summer at the pontiff’s summer residence near Rome. It provides a lively guide to Pope Benedict XVI’s thoughts on all the major dilemmas of his papacy and times. Seewald leaves no holes in the story, presenting his illustrious interviewee (and readers) with an accurate portrait of public opinion. Joseph Ratzinger, the man and the Pope, replies without reticence, revealing the reflective and unpretentious traits of his personality and an unusual capacity to listen respectfully. He makes no attempt to hide the uncertainties and errors behind the series of crises that have marked his papacy, optimistically transforming them into a learning process from which he believes the Church will benefit. 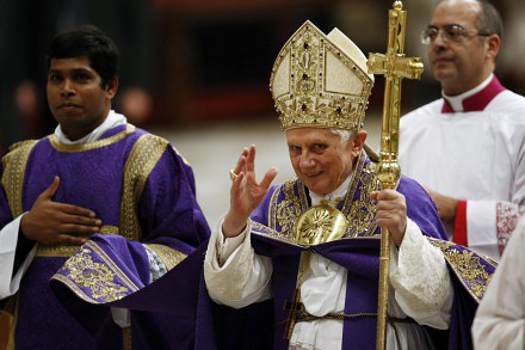 Ratzinger holds true to his belief in the “intrinsic unity of the Old and the New Covenant, the two parts of the Holy Scripture,” an awareness he says he acquired “since the very first day” of his early theological studies. He first made his theological views on Judaism public in 1990, when as the cardinal in charge of the Congregation for the Doctrine of the Faith, he was interviewed in “Jews and Judaism in the Universal Catechism,” a piece published simultaneously in Studi Cattolici (in Italian) and Midstream (in English). These affirmations implicitly contradict and override the statements made by individual Middle East Bishops at the recent Vatican Synod regarding Christ’s having “annulled” the Abrahamic covenant. Holy Father, on April 16, 2005, your seventy eighth birthday, you told your co-workers how much you were looking forward to your retirement Three days later you were the leader of the universal Church with 1.2 billion members. Not exactly a project that one saves for his old age. Actually I had expected finally to have same peace and quiet. The fact that I suddenly found myself facing this maturations task was, as everybody knows, a shock for me. The responsibility is in fact enormous. There was the moment when, as you later said, you felt just as if “a guillotine” were speeding down on you. Yes, the thought of the guillotine occurred to me: Now it falls down and hits you. I had been so sure that this office was no my calling, but that God would now grant me same peace and quiet after strenuous years. But then I could only any, explain to myself. God’s will is apparently otherwise, and something new and completely different is beginning for me. He will be with me. In the so-called “room of tears” during a conclave three sets of robes lie waiting for the future Pope One is long, am short, am middle sized What was going through your head in that roam, in which so many new Pontiffs are said to have broken down? Does am wonder again here, at the very latest: Why me? What duos God want of me? Actually at that moment one is first of all occupied by very practical, external things. One has to see how to deal with the robes and such. Moreover I knew that very soon I would have to my a few words out on the balcony, and I began to think about what I could say. Besides, even at the moment when it hit me, all I was able to say to the Lord was simply: “What are you doing with me? Now the responsibility is yours. You must lead met! I can’t do it. If you wanted me, then you must also help me!” In this sense, I stood, let us any, in an urgent dialogue relationship with the Lord: if he does the one thing he most also do the other. Did John Paul II want to have you as his successor? That I do not know. I think he left it entirely up to the deer Lord. Nonetheless he did not allow you to leave office. That could be taken as an argumentum a silentio, a silent argument for his favorite candidate. He did want to keep me in office; that is well known. As my seventy-fifth birthday approached, which is the age limit when me submits one’s resignation, he said to me, “You do not have to write the letter at all, for I want to have you to the end.” That was the great and undeserved benevolence he showed me from the very beginning. He had read my Introduction to Christianity. Evidently it was an important book for him. As soon as he became Pope he had made up his mind to call me to Rome as Prefect of the Congregation for the Doctrine of the Faith. He had placed a great, very cordial, and profound treat in me. As the guarantee, so to speak, that we would travel the right course in the faith. Jeg har kjøpt min første kindle-bok! Lørdag morgen ville jeg gjerne få tak i Peter Seewalds intervju-bok med pave Benedikt, men så at den allerede var utsolgt hos britiske Amazon. Da kjøpte jeg den like godt i elektronisk kindle-format, og fikk den opp på skjermen på mindre enn ett minutt. Jeg har en stund tenkt å kjøpe meg en Kindle – men det har jeg så langt ikke gjort – men alle bøker i dette formaten kan også leses på en vanlig datamaskin. Castel Gandolfo in the summer. The way to the Pope’s residence led over lonely country roads. In the fields the grain swayed in a gentle breeze, and in the hotel where I had reserved a room a happy wedding party was dancing. Only the lake below in the hollow seemed Peaceful and calm, as big and blue as the sea. As Prefect of the Congregation for the Doctrine of the Faith, Joseph Ratzinger had twice granted me the opportunity to interview him over the course of several days. The Church must not hide, was his attitude; the faith must be explained; and it can be explained, because it is reasonable. He impressed me as being young and modern, not a bean-counter, but rather a man who ventures bravely and rehums his curiosity. A masterful teacher, and a disconcerting one as well, because he sees that we are losing things that we really cannot do without. In Castel Gandolfo some things were different A cardinal is a cardinal, and the Pope is the Pope. Never before in the history of the Church had a Pontiff answered questions in the form of a personal, direct interview. The mere fact of this conversation sets art important new tone. Benedict XVI had agreed to be at my disposal during his vacation, from Monday through Saturday of the last week in July, for one hour each day. Yet I reflected, how candid would his answers turn out to be? …… …..
With this evening’s celebration, the Lord gives us the grace and joy of opening the new liturgical year beginning with its first stage: Advent, the period that commemorates the coming of God among us. Every beginning brings a special grace, because it is blessed by the Lord. In this Advent period we will once again experience the closeness of the One who created the world, who guides history and cared for us to the point of becoming a man. This great and fascinating mystery of God with us, moreover of God who becomes one of us, is what we celebrate in the coming weeks journeying towards holy Christmas. During the season of Advent we feel the Church that takes us by the hand and – in the image of the Blessed Virgin Mary – expresses her motherhood allowing us to experience the joyful expectation of the coming of the Lord, who embraces us all in his love that saves and consoles. While our hearts reach out towards the annual celebration of the birth of Christ, the Church’s liturgy directs our gaze to the final goal: our encounter with the Lord in the splendour of glory. 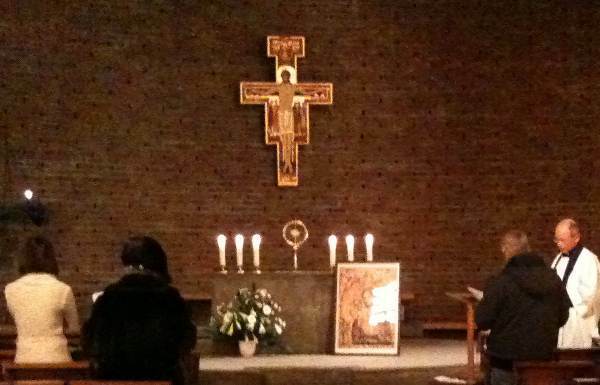 This is why we, in every Eucharist, “announce his death, proclaim his resurrection until he comes again” we hold vigil in prayer. The liturgy does not cease to encourage and support us, putting on our lips, in the days of Advent, the cry with which the whole Bible concludes, the last page of the Revelation of Saint John: “Come, Lord Jesus “(22:20). — Herre, vær nådig mot alle som har syndet mot livet. — Bevar alle barn fra all skade, helt fra deres unnfangelse. — Opplys oss Herre, så vi ser storheten i hvert menneske, helt fra starten av fosterlivet. — Gjør slutt på all ødeleggelse av foster på sykehus og IVF-klinikker. —	Hjelp oss å erstatte urettferdige lover som tillater ødeleggelsen av uskyldige liv, og hjelp statenes ledere til å beskytte de minste og svakeste blant oss. —	Hjelp foreldre som skal få barn med misdannelser til å verdsette barnet du har gitt dem ansvar for. — Hjelp alle leger til å bli livets beskyttere, spesielt for ufødte barn og barn med alvorlige helseproblemer. —	Led alle som har ødelagt uskyldige menneskeliv til å innse hva de har gjort og søke tilgivelse, og helbred og tilgi dem ved din nåde. Å, Maria, den nye verdens morgenrøde, alt levendes mor, deg betror vi livets sak: Se hen, å mor, til den talløse skare barn som hindres i å bli født, de fattige, som tvinges til et byrdefullt liv, til menn og kvinner som er ofre for brutal vold, gamle og syke som drepes av likegyldighet eller misforstått barmhjertighet. Tilskynd alle som tror på din Sønn å forkynne Livets Evangelium med besluttsomhet og kjærlighet til mennesker i vår tid. Gi dem nåde til å ta imot Evangeliet som en stadig ny gave, glede over å feire det med takknemlighet livet igjennom, og mot til å bære vitnesbyrd om det og sammen med alle mennesker av god vilje, besluttsomt å bygge en sivilisasjon hvor sannheten og kjærligheten råder, Gud Skaperen som elsker livet til lov og ære. Amen. Hele programmet for bønnesamlinga finner man her. … Jeg har lest gjennom boken i går og jeg synes den er sterk og god. Det er ikke til å unngå å bli rørt og berørt på flere steder i innholdet og man får en forståelse hvor ille det må være å gjennomgå noe slikt “David” har opplevd. Han håper at boken vil gi andre mot og mulighet til å ta opp sine saker og det håpet slutter jeg meg til. På noen steder kjenner jeg meg igjen i boken selv om jeg ikke har hatt noen lignende opplevelse med biskop Müller. Det jeg tenker på, er frykten for å møte mannen som beskrives så godt i boken. Selv måtte jeg forlate Trondheim i slutten av august 1997, en måned etter mannens bispeordenasjon. Det ble min personlige redning og jeg vil alltid være min orden takknemlig for at den kom meg til unnsetning ved å la meg dra vekk. Det ble et år i Tyskland og mer enn tre år i Argentina. ‘Kaf’ (av og til uttalt som tysk ch) er den hebraiske k-en, og det blir de siste åtte vers at salme 119 (118) vi ser på i denne omgang, på lørdag i uke II – siden advent begynner i morgen, og da starter tidebønnene på nytt med uke I. Vers 83 begynner med ‘ki’, som betyr ‘som’, og v86 begynner et annet vanlig ord ‘kol = alt/alle’. Som jeg har nevnt tidligere kan salme 119 leses på hebraisk og engelsk her. v81 Min sjel fortæres av lengsel etter din frelse, og jeg venter på ditt ord. v83 For jeg er blitt som en tørr skinnsekk; men dine forskrifter glemmer jeg ikke. v84 Hvor lenge skal din tjener vente? Når vil du dømme dem som forfølger meg? v85 De frekke som ikke holder din lov, graver fallgraver for meg. v86 Alle dine bud er pålitelige. Hjelp meg mot dem som forfølger meg med løgn. v87 De har nesten gjort ende på meg her i landet, men jeg svikter ikke dine påbud. v88 Du som er trofast, hold meg i live, så vil jeg følge de lovbud du har gitt. v73 Dine hender har skapt og formet meg. Gi meg innsikt, så jeg lærer dine bud. v74 De som frykter deg, skal se meg med glede, for jeg venter på ditt ord. v75 Herre, jeg vet at dine dommer er rette; i trofasthet har du ydmyket meg. v76 La din godhet være min trøst etter ditt ord til din tjener! v77 La meg møte din miskunn, så jeg kan leve, for din lov er min lyst og glede. v78 La de frekke bli til skamme, de som lyver på meg og gjør meg urett. Jeg grunner på dine påbud. v79 La de gudfryktige vende seg til meg, de som kjenner dine lovbud. v80 La meg følge dine forskrifter av hele mitt hjerte, så jeg ikke blir til skamme. Noe som har nær forbindelse med skriftemålet, men likevel er vidt forskjellig fra det, er avlat. Avlat er ikke syndsforlatelse, men bare en ettergivelse av de timelige (= ikke evige) syndestraffer som et menneske ofte enda har å lide (enten her på jorden eller i renselsesstedet) etter at selve synden (syndeskylden) er forlatt. Neppe noe i den katolske kirkes lære og historie hersker det så mange vrangforestillinger om blant ikke-katolikker som om avlat. I mange av de norske historielærebøker fremstilles avlatspraksisen i middelalderen som et “salg” av “syndsforlatelse”. Med hensyn til avlatens opprinnelse sier de ofte at den egentlig bare var en fritagelse fra kirkestraffer, men at folket etter hvert kom til å tro at de derved fikk syndsforlatelse. Kirken beskyldes for å ha latt folket i denne tro, fordi den fikk inn mange penger på den måte. Anger og omvendelse brydde man seg ikke meget om. Ifølge skolebøkene mente folket at det for å få syndsforlatelse var nok å kjøpe et avlatsbrev. Således skriver f. eks. Bang i sin “Kirkehistorie for folkeskolen” (s. 43): “Når Luther formante folk til å omvende seg, viste de ham bare sitt avlats-brev og sa at de hadde kjøpt syndenes forlatelse for sine penger, og ville derfor ikke høre noe om anger og omvendelse”. Noen skolebøker går så vidt at de beskylder kirken for å ha solgt syndsforlatelse på forskudd for synder man ville komme til å gjøre i fremtiden. Til dette bemerkes at det i de pavelige avlatsbuller (også den av pave Leo X på Luthers tid) uttrykkelig ble sagt at en bare kunne få del i avlaten etter et angerfullt skriftemål. De forutsetter altså at en har fått syndsforlatelse i forveien. Av middelalderens prekener og andaktsbøker fremgår at dette ofte ble fremholdt for folket (sml. Dr. N. Paulus, Gesch. des Ablasses im M. A.). Også Tetzel lærte klart at avlaten bare borttok de timelige straffer for synder som var angret og skriftet. Dette fremgår bl. a. av hans teser fra disputasen i Frankfurt am Oder i 1518. Et angerfullt skriftemål som en betingelse for å få del i avlat stod dessuten nevnt i hvert av de avlatsbrev han utstedte. Det er derfor pur fantasi når det i noen skolebøker blir påstått at folk viste Luther sine avlatsbrev og ikke ville høre om anger og omvendelse under påskudd av at de derved allerede hadde fått syndsforlatelse. Enhver katolikk visste at avlat ikke kunne erstatte skriftemålet, og at det til skriftemålet krevdes anger og omvendelse. Skriftemålet er et så viktig middel i den katolske sjelesorg at det allerede av den grunn er tankeløst å anta at kirken ville ha latt folket tro at de ved avlat kunne få det samme som ved skriftemålet. Det er dessuten kjent nok fra historien at de store avlatsforkynnelser pleide å medføre en stor tilstrømning til skriftestolene. Den tidligere altergutten tok, via mellommenn, kontakt med kirkeledelsen. «David» følte seg etter hvert trodd av kirkens menn i Norge. Men gjennombruddet kom først 17. mai 2009: På nasjonaldagen møtte han Vatikanets ambassadør i Stockholm, erkebiskop Paul Emil Tscherrig, i Oslo. Pavens mann kom med følgende beskjed: Kirken finner historien troverdig og vil ta affære. Müller har tilstått forholdet. «Møtet føltes uvirkelig. Som en drøm. Merkeligst av alt var det at paven kjente til historien min og fant den troverdig», skriver «David» i boka. I salg fra 1. desember 2010. Da det i april 2010 ble kjent at biskop Georg Müller av Trondheim fratrådte sitt embede på grunn av overgrep mot en mindreårig, ble Den katolske kirke i Norge rystet i grunnvollene, og i mediestormen som fulgte oppsto det en mengde diskusjoner og spekulasjoner. Den utsatte har ønsket å publisere sin historie på St. Olav forlag. Boken, som har tittelen INGEN VEI UTENOM – om oppgjøret med en katolsk biskop, publiseres under pseudonymet David. 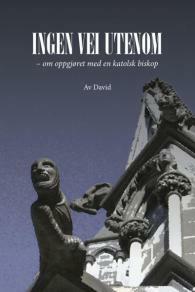 Etter ønske fra David går et eventuelt overskudd i sin helhet til byggefondet for ny St. Olav kirke i Trondheim. Bjørn Are Davidsen har gjort mye for å korrigere nåtidens misoppfatninger av fortiden. Vi omgis av såkalte faktoider på alle kanter; forestillinger som holdes for å være sanne, men som er feilaktige. Hvem har ikke hørt at millioner av hekser ble brent på bålet i middelalderen, da folk trodde at jorden var flat og kirken forfulgte alle som mente noe annet? Hvor ofte gjentas det ikke at kirken på kirkemøtet i Nikea med knapt flertall vedtok at kvinnen hadde sjel, og at de samtidig bestemte seg for å brenne alle alternative evangelier om Jesus? Noen har sikkert også hørt at kirken brant ned biblioteket i Alexandria, og utryddet så mye den kunne av kunnskapen fra den greske antikken? Eller hvordan kirken i nyere tid fordømte Kopernikus og fengslet Galileo Galilei i årevis for deres forsøk på å plassere solen i sentrum for solsystemet? Alt er innordnet en større historie der kirken framstår som bakstreversk, antivitenskaplig og framskrittshindrende. Kirken er kort og godt historiens «bad guy», som bare langsomt er blitt overvunnet av humanismens og vitenskapens lys. Det har aldri vært Luthers mening å avskaffe skriftemålet. Tvert imot, han forsvarte det ofte med stor kraft. Han gav det en fast plass i sin “Bønnebok” fra 1527. Hans “Store Katekismus” (2. utg. 1529) inneholder en formaning til skriftemål på 8 sider, hvor det likefrem sies at en som forkaster skriftemålet, ikke er kristen. “Hvis du forakter det og i stolthet unnlater å skrifte, da slutter vi at du ikke er noen kristen og ikke berettiget til å nyte Alterets sakrament. For du ringeakter det som ingen kristen skal ringeakte, og viser derved at du ikke kan ha syndenes forlatelse” …. “Derfor, når jeg formaner til skriftemål, da gjør jeg intet annet enn at jeg formaner enhver til å være en kristen”. Nærmest helt katolsk er den skriftemålsundervisning som finnes i Luthers “Lille Katekismus” (slik som den ble utgitt siden 1531 og ble inntatt blant de lutherske bekjennelsesskrifter). “Til skriftemålet” så heter det der – “hører to stykker: for det første at man bekjenner synden, og for det annet at man tar imot avløsningen eller syndsforlatelsen av skriftefaren som av Gud selv og aldeles ikke tviler derpå, men tror fast at syndene derved er forlatt for Guds åsyn i himmelen”. I samme instruks gir han et detaljert skriftespeil (synderegister) til hjelp for de skriftende. “Den augsburgske konfesjon” (1530) sier i Art. 75 (“Om skriftemålet”): “Skriftemålet er ikke avskaffet i våre kirker. Man pleier jo ikke rekke Herrens legeme til andre enn dem som i forveien er blitt prøvet og avløst …. Man lærer menneskene at de skal akte avløsningen overmåte høyt, fordi den er Guds røst og tilsies etter Guds befaling. Nøklemakten blir holdt i ære, og man minner om hvilken stor trøst den bringer de forferdede samvittigheter”. “Apologien for den augsburgske konfesjon” (Art. XII) betegner det som “ugudelig” å ville “bortskaffe den private absolusjon av kirken”. Også de lutherske “Smalkaldiske Artikler” insisterer på bibeholdelsen av skriftemålet. “Da absolusjonen eller nøklemakten også er en hjelp, en trøst mot synden og den onde samvittighet, innstiftet av Kristus i Evangeliet, må kirken endelig for alle ting ikke la skriftemålet eller absolusjonen gå av bruk” (P. III, Art. 8). Den såkalte “Reformatio Vitebergensis”, som Luther underskrev sammen med andre teologer, forplikter presten til å la straffe “den som et helt år hverken søker absolusjon eller kommer til Herrens nattverd”. Selv skriftet Luther ofte, særlig hos Bugenhagen. Skriftemålet var ham så dyrebart at han “ville grave det opp av jorden og hente det over tusener mil” (Walch XIX, 1073). “Om tusener og atter tusener av verdener var mine, så ville jeg dog heller miste alt dette enn la et eneste stykke, selv det ringeste, av dette skriftemål komme ut av kirken” (Walch XVII, 2452). I “Den augsburgske konfesjon” (Art. IX-WII) og i “Apologien for den augsburgske konfesjon” (Art. XIII) regnes skriftemålet som et sakrament. Likeledes i Luthers “Store Katekismus”, hvor det omtales som “det tredje sakrament”. I hans “Lille Katekismus” fikk det plass mellom dåpen og Alterets sakrament. Ennå året før sin død uttalte Luther at han gjerne vil være med på å kalle skriftemålet et sakrament. … Etterhånden er skriftemålet mer og mer gått ut av bruk hos lutheranerne. Forskjellige årsaker har bidratt til denne utvikling. En av hovedårsakene er lutheranismens uklare standpunkt fra begynnelsen av med hensyn til skriftemålets nødvendighet. …. Hele kapittelet kan leses her. Selv bortsett fra de nådegaver som botens sakrament først og fremst er innstiftet til (syndsforlatelse, den helliggjørende nåde med en særlig nådehjelp til livets forbedring), er skriftemålet også av mange andre grunner overordentlig nyttig for det enkelte menneske og for hele samfunnet. 1. Skriftemålet er et middel til å bekjempe det menneskelige hovmod, som er syndens rot. 2. Den tanke at også hemmelige synder må skriftes, er en tøyle mot lidenskapene. Syndene trives best i mørket, dvs. så lenge de kan begås i hemmelighet. Mange har mindre frykt for Guds dom enn for menneskenes dom. Derfor har Gud bestemt at syndene ikke bare skal bekjennes for ham. I sin barmhjertighet bruker han menneskenes frykt for hverandres dom til å bevare dem for hans dom og den evige fordømmelse. 3. Skriftemålet tvinger et menneske til ofte å ransake sin samvittighet. 4. Skriftemålet tvinger oss til å gjøre større alvor av vår vilje til å forbedre vårt liv. 5. Skriftemålets sakrament er en stor kilde til sjelefred og derved meget nyttig for den sjelelige sunnhet. Når en sorg trykker oss, føler vi oss lettet i hjertet ved å åpne vårt hjerte for en annen, som vi har tillit til. Dette gjelder ikke minst samvittighetskvaler, som er den største smerte. Liksom den legemlige helbredelse ofte begynner med at maven kaster opp giftstoffene, således er syndsbekjennelsen begynnelsen til sjelens helbredelse. …..
6. Skriftemålet er uunnværlig for sjelesorgen. I skriftestolen finner vi en åndelig lege som vi ikke bare åpenbarer våre svakheter for, men som også hjelper oss til å oppdage dem. Ingen er en god dommer i sin egen sak. Han viser de farer som truer vår sjel, og de midler som er nødvendige for å unngå dem. Med vår skriftefar taler vi frimodig om våre indre vanskeligheter, fordi å høre skriftemål er hans embete, som han i kraft av prestevigselens sakrament får en særlig nådehjelp til, og som han ved et langvarig studium på en særlig måte er blitt utdannet til, og fordi det på grunn av sakramentets ubrytelige segl ikke er noen fare for at han vil tale med andre om det vi har betrodd ham. Tet er en av de to bokstavene på hebarisk som uttales ‘t’ – de andre, ‘tav’ kommer på slutten av alfabetet. Av de åtte versa vi leser i dag, begynner fem med ordet ‘tov’, som betyr god/godt. 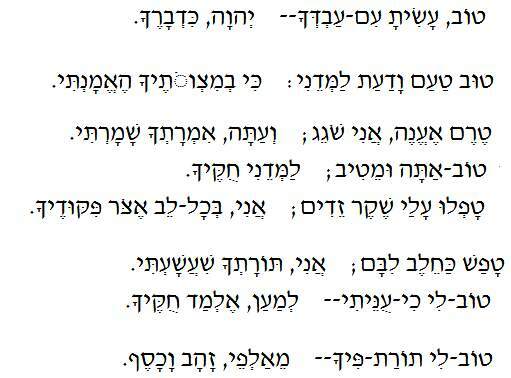 Første verset vi ser under sier: “Tov asita imavdechá, Adonai (JHVH) kidvarécha’ = Godt har du gjort mot din tjener, Herre etter ditt ord. Salme 119 (118) kan leses på hebraisk og engelsk her. v65 Herre, etter ditt ord har du gjort vel mot din tjener. v66 Gi meg kunnskap og god forstand, for jeg tror på dine bud! v67 Før jeg ble ydmyket, fór jeg vill, men nå holder jeg meg til ditt ord. v68 Du er god, og du gjør godt. Lær meg dine forskrifter! v69 De frekke har svertet meg med løgn, men jeg holder helhjertet dine påbud. v70 Deres hjerte er fett og sløvt, men jeg har min lyst i din lov. v71 Det var godt for meg at jeg ble ydmyket, så jeg kunne lære dine forskrifter. v72 For meg er loven som du forkynner, bedre enn tusen stykker gull og sølv. 1. Hvorfor skal jeg henvende meg til et menneske for å få syndsforlatelse? Gud alene kan forlate synder. Det er mot ham vi har syndet. Derfor vil jeg søke tilgivelse hos ham uten mellomkomst av en prest, som også selv er et syndig menneske. Uten tvil er det Gud alene som kan forlate synder. Men spørsmålet er hvorledes han vil gjøre det. Og dette er noe som han alene har rett til å bestemme. Da jødene engang gjorde den samme innvending: “Hvem kan forlate synder uten Gud alene?”, sa Jesus at “Menneskesønnen hadde makt på jorden til å forlate synder” (Luk. 5,21-24). Liksom Jesus hadde denne makt ikke bare som Gud, men også som menneske (som “menneskesønnen”), kan han også utøve denne makt gjennom mennesker. Hvis vi forkaster skriftemålets sakrament under påskudd av at Gud alene kan forlate synder, må vi også forkaste dåpens sakrament. Jesus er sakramentenes egentlige forvalter. Prestene er bare hans redskaper. De forvalter sakramentene i kraft av hans oppdrag, og det er hans ledsagende nåde som gir sakramentene deres virkning. …. 2. Er ikke skriftemålet et altfor lettvint middel til å få syndsforlatelse? Katolikkene – sies det – kan synde så ofte de vil, og så hver gang etterpå bare gå til skrifte. Det er merkelig at man forkaster skriftemålet den ene gang fordi det er en altfor stor byrde, og den annen gang fordi det er altfor lettvint. Enhver katolikk vet, og kirken fremholder det stadig i sin forkynnelse, at skriftemålet (og den av presten meddelte absolusjon) er ugyldig, hvis en skrifter med den mening etterpå å begå de samme synder om igjen. Skriftemålet krever en alvorlig selvprøvelse. Til et godt forsett hører at man er beredt til å unngå de nærmeste anledninger til synd, å gjøre godt igjen den skade man har forvoldt andre, og å forsone seg med de personer man har levd i fiendskap med. …. 3. Medfører ikke skriftemålet en fare for usømmelige forhold mellom presten og skriftebarnet? 4. Skriftemålet er bare et maktmiddel for prestene til å herske over menneskenes samvittighet. v57 Herren er min lodd og del; jeg har sagt at jeg vil holde dine ord. v58 Jeg bønnfaller deg av hele mitt hjerte: Vær meg nådig etter ditt ord! v59 Jeg har grunnet på min ferd og vendt meg til dine lovbud. v60 Jeg dryger ikke, men skynder meg med å holde dine bud. v61 De gudløses snarer slynger seg om meg, men jeg har ikke glemt din lov. v62 Midt på natten står jeg opp og priser deg for dine rettferdige dommer. v63 Jeg holder meg til alle som frykter deg, og som følger dine påbud. v64 Jorden er full av din miskunn, Herre. Lær meg dine forskrifter! Did the Pope “justify” condom use in some circumstances? No. And there was absolutely no change in Church teaching either. Not only because an interview by the Pope does not constitute Church teaching, but because nothing that he said differs from previous Church teaching. Then why all the headlines saying that he “approves” or “permits” or “justifies” condom use in certain cases? That’s a good question. So good that the interviewer himself asked virtually the same question during the interview. The Pope clarified and expanded on his previous statement. So let’s look at the two statements. After saying that “we cannot solve the problem [of AIDS] by distributing condoms…” and that “the sheer fixation on the condom implies a banalization of sexuality…” the Pope says: There may be a basis in the case of some individuals, as perhaps when a male prostitute uses a condom, where this can be a first step in the direction of a moralization, a first assumption of responsibility, on the way toward recovering an awareness that not everything is allowed and that one cannot do whatever one wants. But it is not really the way to deal with the evil of HIV infection. That can really lie only in a humanization of sexuality”. Lese hele hans innlegg her. Skriftemålspraksisen har nok – liksom meget annet i den kristne religion – gjennomgått en utvikling. Men det vesentlige i den, nemlig en angerfull syndsbekjennelse for presten og en autoritativ forsoning gjennom ham med kirken og Gud, har i alle århundrer vært det samme. Man er bare forpliktet til å skrifte “dødssyndene”, dvs. de store synder som medfører tapet av nådelivet. De mindre (såkalte “tilgivelige”) synder behøver man ikke å skrifte, men det er nyttig å gjøre det. En utvikling har det vært i bedømmelsen av hvilke synder som må anses som dødssynder. Dette spørsmål var fra begynnelsen av ikke så avgjort som i vår tid. For de største synder, spesielt når det gjaldt frafall fra troen, mord og ekteskapsbrudd, ble det i oldtiden pålagt en langvarig offentlig bot. En tid var det endog bestemt at de som falt tilbake i de sistnevnte grove synder, ikke på nytt skulle få adgang til botens sakrament. Hensikten dermed var å avskrekke fra tilbakefall, og dessuten tvilte man på om de tilbakefalnes omvendelse var oppriktig. Om denne bestemmelse alltid ble gjennomført i praksis, er vanskelig å si. Imidlertid lærte kirken ikke at slike mennesker, såfremt deres omvendelse var oppriktig og de var villige til å skrifte, umulig kunne bli frelst. Selv bortsett fra de mange vitnesbyrd i oldkirkens historie, som beviser at skriftemålet alltid har vært i bruk, er det allerede i seg selv utenkelig at kirken hadde kunnet innføre en slik institusjon. Hvorledes ville hele kristenheten, både i øst og vest, ha villet underkaste seg noe så ydmykende, uten at kirken kunne henvise til en praksis fra begynnelsen av? Historien viser at så snart en eller annen vranglærer forsøkte å innføre noe nytt, oppstod det alltid en teologisk strid. Men vi leser aldri om en kirkestrid på grunn av skriftemålets innførelse, noe som mer enn noe annet ville ha satt sinnene i bevegelse. Allerede i det gamle skrift “De tolv apostlers lære” (en slags katekisme fra årene 85-90) tales det flere ganger om skriftemålet, som tydeligvis forutsettes å være en fast praksis. “I menigheten skal du bekjenne dine overtredelser og ikke komme til bønnen (= nattverdsgudstjenesten) med en dårlig samvittighet” (kap. 4). “Når dere er samlet på Herrens dag, så bryt brødet og hold takksigelse, etter at dere har bekjent deres overtredelser, fordi deres offer (messeofferet) må være rent” (kap. 14). Syndene måtte bekjennes “i menigheten”. Det mentes altså ikke en bekjennelse for Gud alene (da denne like så godt kunne gjøres andre steder). At man avla sin syndsbekjennelse for prestene, bekreftes av det at det straks etterpå (i kap. 15) tales om de prester som “derfor” (nemlig til forvaltning av nattverden og botens sakrament) måtte innsettes, og som fremfor alt måtte være “saktmodige”. Ved å anta at det siktes til det sakramentale skrifternål (og ikke bare til en liturgisk bønn med generell syndsbekjennelse), forstår vi også bedre hvorfor de troende så strengt (gjentatte ganger) måtte oppfordres til denne bekjennelse. En liturgisk fellesbønn krever ingen selvfornedrelse og ville de troende nok av seg selv ha tatt del i. En lignende oppfordring til skriftemålet som en forberedelse til nattverdsgudstjenesten finnes i det såkalte “Barnabas’ brev” (fra kort etter året 100): “Du skal bekjenne dine synder og ikke komme til bønnen med en dårlig samvittighet” (kap. 19). Les hele kapittel her – og her er en oversikt over hele heftet. Præcínge me, Dómine, cingulo puritátis, et exstíngue in lumbis meis humórem libídinis: ut máneat in me virtus continéntiæ, et castitátis.